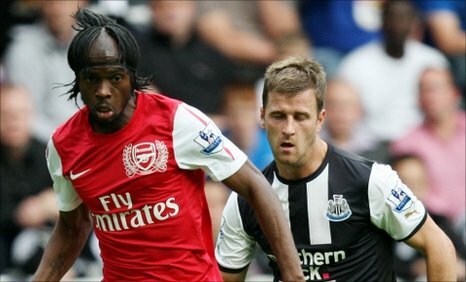 Arsenal's difficult week continued as Gervinho was sent off on his Gunners debut and they were unable to break down a stubborn Newcastle side. The Ivorian striker was shown a red card with 14 minutes to go when he slapped Joey Barton after the pair had tangled in the penalty area. Arsenal, who left Cesc Fabregas and Samir Nasri out of their squad, had struggled to create meaningful chances. Robin van Persie had their best opening but his shot was deflected wide. Attention after the game is sure to focus on Barton, who was stamped on by Alex Song in an incident missed by referee Peter Walton, but went down far too easily when he clashed with Gervinho. The Newcastle midfielder also arguably instigated the incident when he remonstrated with Gervinho following a failed penalty appeal by the Arsenal frontman, dragging him to his feet. But, although Gunners boss Arsene Wenger could claim it was harsh on Gervinho to see red while Barton was only booked, it must have been almost as frustrating for him to watch his side toil against an unambitious Newcastle side. His preparations for the new season could hardly have been worse, with moves for Fabregas and Nasri, which had been rumoured all summer, beginning to look more concrete last week as the big kick-off approached. Wenger's decision to leave out that pair, plus the absence of Jack Wilshere through injury, left the Gunners with a second-string midfield trio of Tomas Rosicky, Andrey Arshavin and Aaron Ramsey alongside Alex Song, and they quickly ran out of ideas. Before his untimely exit, Gervinho had made a lively debut, running at the Magpies defence and causing them plenty of problems, although he did fluff his lines when presented with an early shooting chance. But, despite the Gunners being camped in the Magpies' half and out-passing their opponents, they could not turn their vastly superior possession into clear-cut chances. Probably their best first-half chance was snuffed out by a timely challenge by Steven Taylor, who did enough to put off Van Persie after his own clearance had bounced back off Fabricio Coloccini and back into the striker's path. Danny Simpson hacked clear off the line after Tim Krul failed to deal with Rosicky's corner but a golden opportunity went begging when Arshavin failed to free Van Persie after catching Newcastle in possession. At the other end, only Simpson's mis-hit cross caused Wojciech Szczesny any real difficulties, with the young Pole scrambling to deal with it at his near post. The Newcastle fans, who have also seen some big names depart St James' Park in the past few months, were clearly frustrated by the lack of endeavour shown by their team before the break but their side's defending continued to deserve credit into the second half. A whipped free-kick by Van Persie was the closest Arsenal got to breaking the deadlock, and their hopes of an opening-day victory were all but ended when Gervinho was dismissed. To leave the north-east with a point is by no means a disaster but the performance and outcome was hardly the shot in the arm Wenger's men needed ahead of a pivotal week. They host Liverpool in the league next weekend, in between both legs of a Champions League qualifier with Udinese in which they can afford no more hiccups. 90:00+4:56 The final whistle goes and the game is over. 90:00+4:21 Robin van Persie has an effort at goal from outside the box which goes wide right of the goal. 90:00+2:20 Substitution Aaron Ramsey goes off and Johan Djourou comes on. 90:00+1:31 Outswinging corner taken right-footed by Joey Barton from the right by-line, clearance made by Robin van Persie. 90:00+1:25 Fabricio Coloccini delivers the ball, clearance by Laurent Koscielny. 90:00+0:29 Free kick crossed by Joey Barton, Robin van Persie makes a clearance. 90:00+0:29 Booking Thomas Vermaelen receives a caution. 90:00+0:22 Leon Best fouled by Thomas Vermaelen, the ref awards a free kick. 89:37 Joey Barton produces a right-footed shot from just outside the box that goes wide left of the goal. 89:28 Jonas Gutierrez crosses the ball, clearance made by Thomas Vermaelen. 88:36 The assistant referee flags for offside against Robin van Persie. Indirect free kick taken by Steven Taylor. 87:47 Free kick awarded for an unfair challenge on Emmanuel Frimpong by Gabriel Obertan. Direct free kick taken by Thomas Vermaelen. 84:23 Substitution Emmanuel Frimpong is brought on as a substitute for Tomas Rosicky. 81:59 Theo Walcott sends in a cross, Kieran Gibbs takes a shot. Save by Tim Krul. 81:15 Effort on goal by Joey Barton from outside the box goes harmlessly over the bar. 80:07 Substitution Peter Lovenkrands on for Yohan Cabaye. 79:48 Shot by Ryan Taylor from just outside the area goes over the net. 78:52 Shot from just outside the area by Aaron Ramsey misses to the right of the target. 77:04 Booking Wojciech Szczesny is booked. 75:48 Booking Joey Barton is cautioned by the ref for unsporting behaviour. 75:12 Sent off Yao Gervinho is sent off. 72:35 Substitution Leon Best joins the action as a substitute, replacing Shola Ameobi. 72:26 Jonas Gutierrez crosses the ball. 71:17 Yao Gervinho produces a cross. 70:50 Inswinging corner taken by Tomas Rosicky from the left by-line. 67:42 The ball is crossed by Yao Gervinho, Tim Krul makes a comfortable save. 66:11 Bacary Sagna restarts play with the free kick. 66:11 Booking Cheik Tiote receives a yellow card. 66:08 Cheik Tiote challenges Aaron Ramsey unfairly and gives away a free kick. 64:52 Bacary Sagna produces a left-footed shot from just outside the area that goes harmlessly over the bar. 63:52 Theo Walcott takes a shot. Save by Tim Krul. 60:42 Substitution Theo Walcott on for Andrey Arshavin. 58:36 Joey Barton concedes a free kick for a foul on Alex Song. Direct free kick taken by Alex Song. 56:09 Thomas Vermaelen challenges Shola Ameobi unfairly and gives away a free kick. Joey Barton crosses the ball in from the free kick, Thomas Vermaelen manages to make a clearance. 54:51 Shola Ameobi challenges Kieran Gibbs unfairly and gives away a free kick. Direct free kick taken by Kieran Gibbs. 53:07 Jonas Gutierrez gives away a free kick for an unfair challenge on Bacary Sagna. Robin van Persie shoots direct from the free kick. 51:04 Ryan Taylor takes the direct free kick. 51:04 Booking Tomas Rosicky is cautioned. 50:55 Tomas Rosicky challenges Jonas Gutierrez unfairly and gives away a free kick. 50:21 Inswinging corner taken left-footed by Robin van Persie from the right by-line, clearance by Joey Barton. 49:56 Bacary Sagna fouled by Shola Ameobi, the ref awards a free kick. Thomas Vermaelen restarts play with the free kick. 48:27 Aaron Ramsey concedes a free kick for a foul on Jonas Gutierrez. Free kick taken by Fabricio Coloccini. 47:10 Free kick taken by Steven Taylor. 47:10 Booking Kieran Gibbs shown a yellow card. 47:01 Kieran Gibbs gives away a free kick for an unfair challenge on Joey Barton. 45:01 Substitution Gabriel Obertan is brought on as a substitute for Demba Ba. 45:00+0:46 Bacary Sagna takes the direct free kick. 45:00+0:46 Booking Fabricio Coloccini goes into the book for unsporting behaviour. 45:00+0:39 Fabricio Coloccini gives away a free kick for an unfair challenge on Yao Gervinho. 43:56 Kieran Gibbs concedes a free kick for a foul on Joey Barton. Shot comes in from Ryan Taylor from the free kick. 43:42 The ball is delivered by Yohan Cabaye, Thomas Vermaelen makes a clearance. 41:32 Kieran Gibbs crosses the ball. Centre by Andrey Arshavin, clearance made by Fabricio Coloccini. 41:11 Andrey Arshavin produces a cross, Steven Taylor makes a clearance. 39:06 Andrey Arshavin sends in a cross, Tim Krul makes a save. 35:18 Cheik Tiote concedes a free kick for a foul on Bacary Sagna. Wojciech Szczesny takes the direct free kick. 34:28 Kieran Gibbs sends in a cross, save by Tim Krul. 33:56 Ryan Taylor has a shot on goal from outside the area which misses right. 33:08 Inswinging corner taken right-footed by Yohan Cabaye from the left by-line, Thomas Vermaelen manages to make a clearance. 33:02 Danny Simpson sends in a cross, Laurent Koscielny makes a clearance. 32:03 Corner taken by Robin van Persie from the right by-line, clearance made by Steven Taylor. 31:20 Ryan Taylor challenges Yao Gervinho unfairly and gives away a free kick. The free kick is swung in left-footed by Robin van Persie, Cheik Tiote manages to make a clearance. 31:08 Kieran Gibbs produces a cross, Jonas Gutierrez makes a clearance. 30:04 Corner taken right-footed by Tomas Rosicky from the left by-line, save by Tim Krul. 29:55 Kieran Gibbs delivers the ball, Joey Barton gets a block in. 28:40 The free kick is delivered right-footed by Ryan Taylor from left wing, Thomas Vermaelen makes a clearance. 28:40 Booking Alex Song receives a yellow card. 28:36 Foul by Alex Song on Demba Ba, free kick awarded. 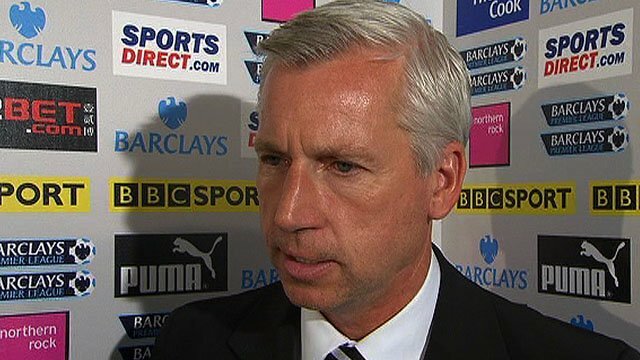 27:29 Jonas Gutierrez delivers the ball, clearance by Aaron Ramsey. 26:53 Tomas Rosicky challenges Shola Ameobi unfairly and gives away a free kick. Ryan Taylor takes the free kick. 25:03 Danny Simpson is flagged offside by the assistant referee. Kieran Gibbs restarts play with the free kick. 24:41 Alex Song concedes a free kick for a foul on Joey Barton. Joey Barton takes the free kick. 21:36 The ball is crossed by Danny Simpson, Jonas Gutierrez has an effort at goal from just inside the box that misses to the right of the goal. 20:43 Unfair challenge on Joey Barton by Alex Song results in a free kick. Free kick crossed by Joey Barton, save by Wojciech Szczesny. 17:42 Inswinging corner taken left-footed by Robin van Persie, clearance made by Demba Ba. 17:20 Yao Gervinho produces a cross, Steven Taylor makes a clearance. Robin van Persie takes a shot. Steven Taylor gets a block in. 16:05 Danny Simpson delivers the ball, save by Wojciech Szczesny. 12:49 The ball is sent over by Andrey Arshavin, clearance by Danny Simpson. 11:51 The referee blows for offside. Indirect free kick taken by Thomas Vermaelen. 10:57 Shola Ameobi is flagged offside by the assistant referee. Thomas Vermaelen restarts play with the free kick. 9:53 The ball is sent over by Bacary Sagna, blocked by Ryan Taylor. 9:19 The ball is delivered by Robin van Persie, clearance made by Danny Simpson. 7:36 The ball is swung over by Yao Gervinho, clearance by Ryan Taylor. 4:32 Alex Song challenges Shola Ameobi unfairly and gives away a free kick. Direct free kick taken by Joey Barton. 3:44 Aaron Ramsey takes a shot. Blocked by Steven Taylor. 3:02 Bacary Sagna sends in a cross, blocked by Ryan Taylor. 1:45 The ball is delivered by Joey Barton, save by Wojciech Szczesny. 1:06 Tomas Rosicky produces a right-footed shot from just outside the box that goes wide right of the goal.